The photos people have of the Millinery Conference at Williamsburg– well, they’re a little envy-inducing. All the silks gowns on such a beautiful site are a little overwhelming if you like historic costumes, but if I was all about silk gowns it might be harder to do what I am doing. I did discover a fool-proof way to unnerve the teenager in the living history household. 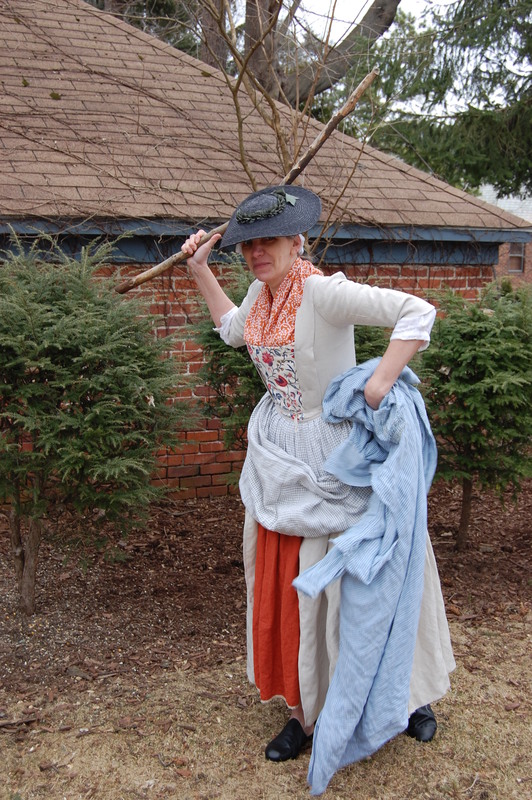 If you get dressed in your 18th-century clothing early enough on a Sunday morning, the child will ask, “Um, Mom? Are you just fitting, or do we have an event?” You get one glorious moment to decide whether or not to torture the child before he figures out that even you are not crazy enough to go to an event in March without stockings. Bridget’s gown is done, but for the hem, which is turned up and about a quarter sewn. I tried it on yesterday to make sure it fit. I threw most caution to the wind and made up the new Golden Scissors English Gown pattern without making a muslin because I’d checked my own self-fitted pattern pieces to the English Gown pieces and found them nearly identical. Anything likely to need work– shoulder straps– I knew could be done in the lining and not matter terrifically. Why, you ask, did I bother with a new pattern? In part because my own has migrated (my backs have been trending too wide of late) and because I needed a solid, step-by-step guide to more correct assembly. The sleeve pleats still annoy me, mostly because they get done on a dress form and not on me, but they allow movement and that really counts. The stomacher front style is a compromise: I want to be able to wear this at events earlier than 1782, so I’m working on the assumption that Bridget didn’t migrate to the more fashionable center-front closing style in the 1780s because she couldn’t. The accessories are chosen because they were affordable ways to upgrade appearance: it takes hardly any chintz for a stomacher, and a handkerchief is bright but small. The hat is more common than a bonnet among working women, and the mules were chosen because they appear in an engraving of a crippled soldier and his family. All Sandby’s women wear heeled and buckled shoes in styles not to be found ready-made in my size, so mules are my compromise. Hat, Burnley and Trowbridge, lined with a Wm Booth remnant, trimmed with B&T ribbon. My hair is out up with straight pins from Dobyns & Martin, and under the hat in a lappet cap with the strings tied on top of my head. The coral necklace is from In the Long Run, I’ll replace the grey poly ribbon with black silk ribbon once it’s in from Wm Booth. 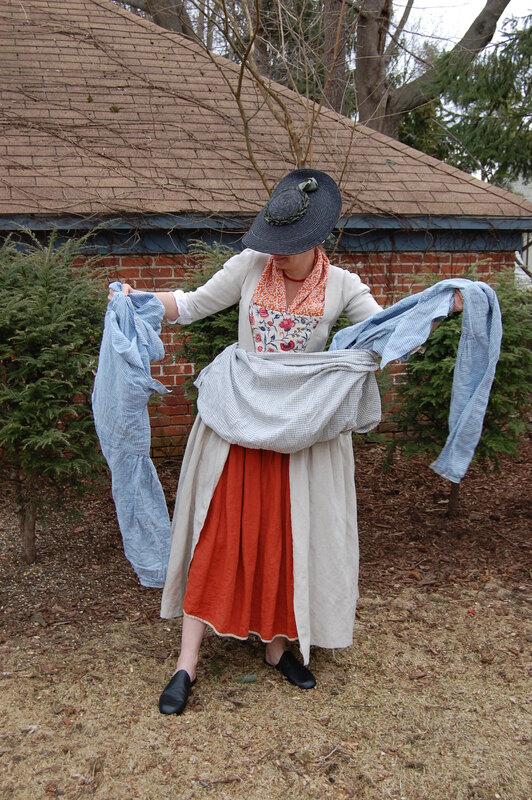 The neckerchief is from B&T, again, and selected because the pattern was similar to the one worn by the young woman in the Domestick Employment: Washing print. The gown fabric is from the second floor discount loft at the Lorraine mill store in Pawtucket. It’s 100% cotton, yes, it really does flame, and I’ll just have to be careful. (The women who cook in cotton at OSV are probably vastly more graceful than I, and do not fall into things.) It’s a light brown and white tiny check weave, and looks a great deal like a homespun gingham. I chose it because it tends to wrinkle badly and should show the dirt well: in short, I chose it because I don’t expect it to wear particularly well. 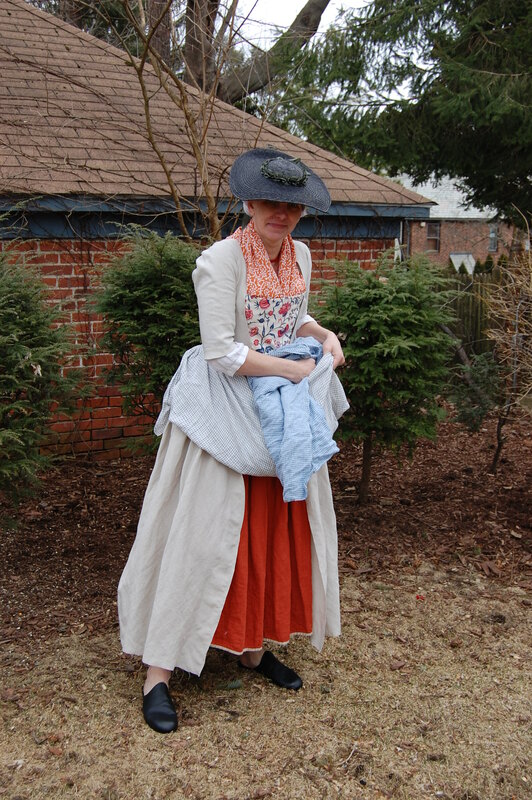 The petticoat is from the last of some ‘madder’ linen Burnley & Trowbridge had a few years ago, and the mules are from them; I think the apron linen was, too, but I can’t remember. Those shirts are blue and white check from Wm Booth, and I have no idea how they got into my apron. Stop asking, or I’ll get my stick. It looks great! I may have to get that pattern. I have a friend going to a draping workshop in 2 weeks. So she is going to practice on me afterwards. I’ve draped and fitted to myself and the form, but never had anyone really drape on me– that should be fun! The instructions were awesome. I tend to forget how things go together, even things I’ve made multiple times, so these helped me do this correctly. Wish I still lived in the 2-up, 2-down in Cranston so I could tag along to the Pawtucket store and get your good advice about fabric choices! I’d say you’ve got Bridget nailed! Thank you! She is fun to figure out. Lorraine’s second floor where everything is $1.99! Amazing stuff. You could outfit a Rotary banquet ca. 1986 from that floor, right down to the banquettes, but there’s a pretty interesting selection.